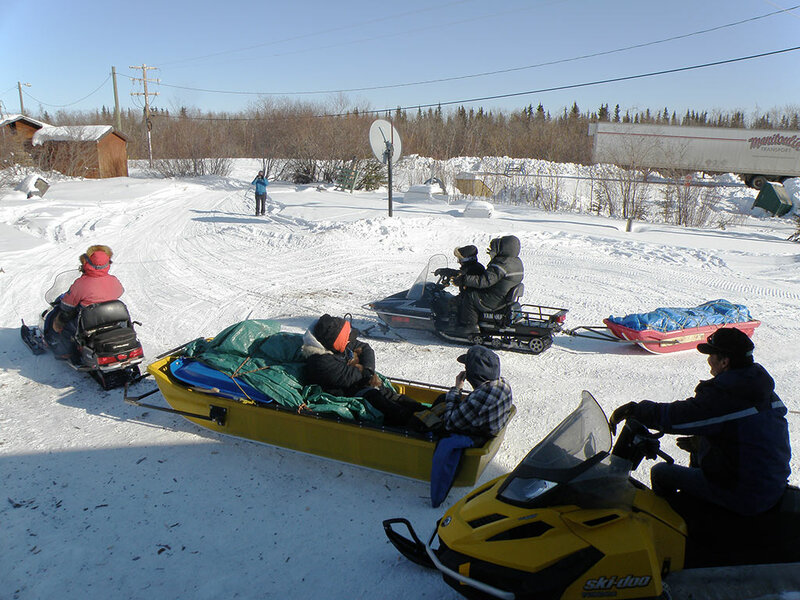 Joseph's family leaving to go up river where they will stay for several months over breakup until the ice goes out of the river. There are no family cars here in Old Crow and no roads out of town. 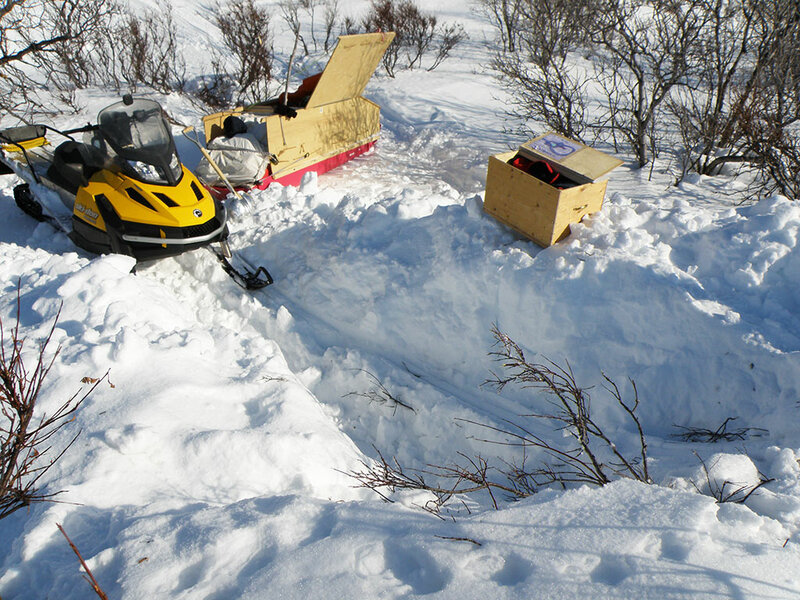 The family vehicle in the winter time is a Skidoo. They plowed an ice road into town this year to haul suppies in to build a new store, among other things, and that is why there is a semi-trailer in the background. 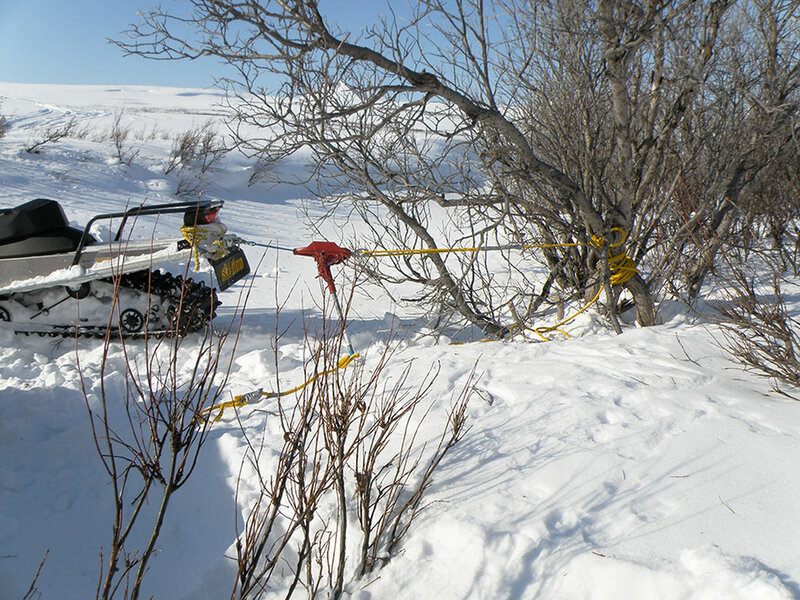 The public is not allowed on the ice road. This is upriver at Joseph's camp on my way back. Everyone is on the river bank watching the Ranger patrol go by that is pictured on page 1. 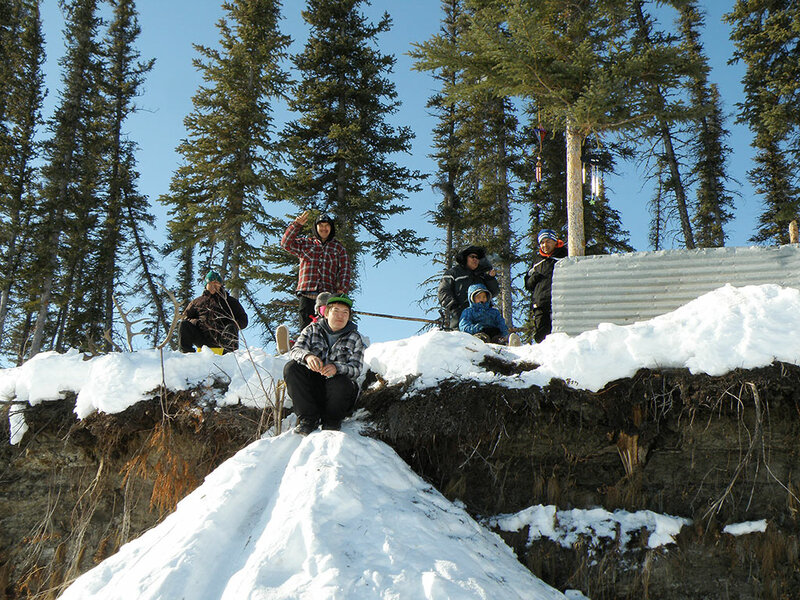 The main activities now are trapping and cutting firewood. They will make a big raft of firewood logs and take it downriver after breakup. On my way back I spun out, got buried in a hole under a bank and had to dig out. This is a winch I carry for such tasks. Usually when I get stuck it is in water under the snow on the river. Providence has always provided a bush or tree within reach of my ropes.Once the bush was about 150 feet away and the last foot or two of rope was just enough to tie on. Notice how barren the landscape is in the background. 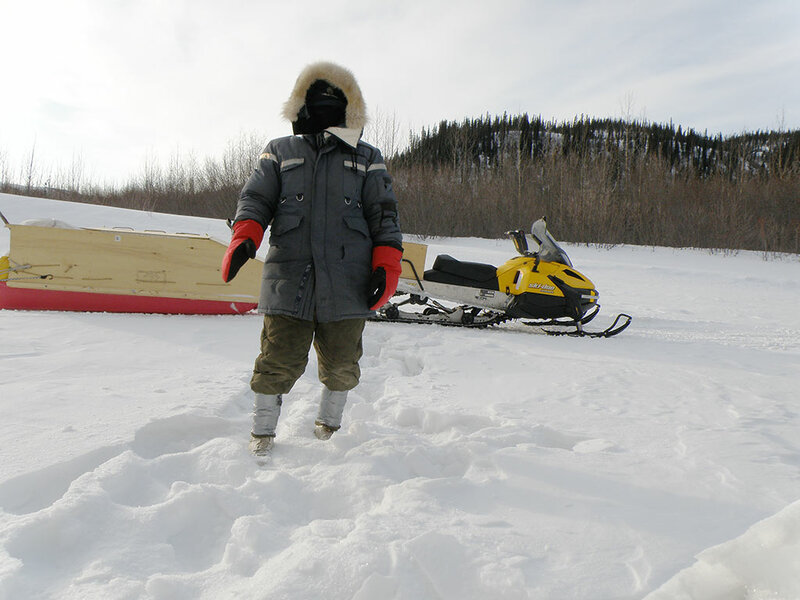 This is my dress for these warmer spring days traveling on the Skidoo in the wind. I have on a black face mask. I'm wearing military 'Bunny Boots', and my snow pants are taped tight around the boots. These snow pants were given to me in the 1970's by the Loraine Cash family. 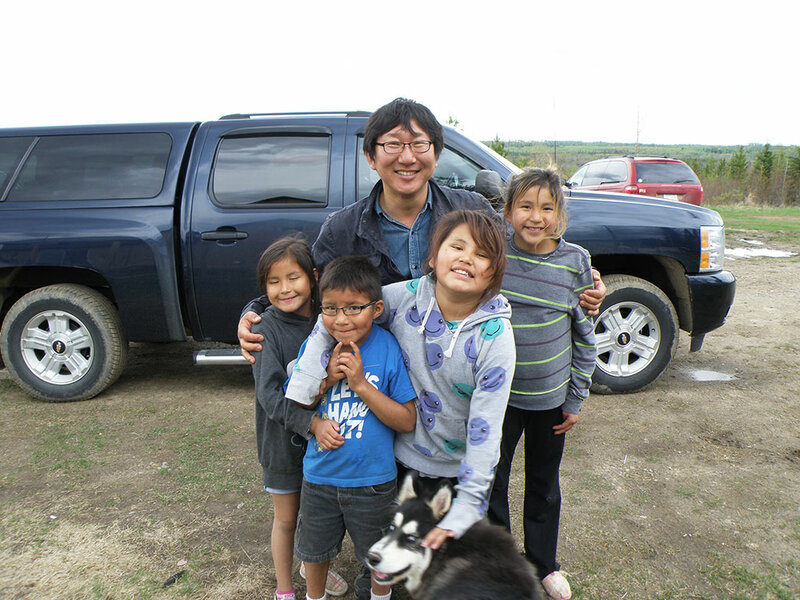 They had lived in Kotzebue, Alaska and moved to South Dakota and wouldn't need them any more. This is Ernest traveling with me here. He camped up at Stoney cabin and waited for me to show up, then we traveled together to Ft. McPherson. This is David from the Korean church in Calgary. He has been coming every Sunday to help in Sunday School. He will be bringing his family for several weeks in July and they will be the cooks for the large teams that will be staying here. There will be about 25 people eating 3 meals a day in the teams during VBS. Eleven will be here from Pennsylvania and when they leave we pick up 11 more at the airport. 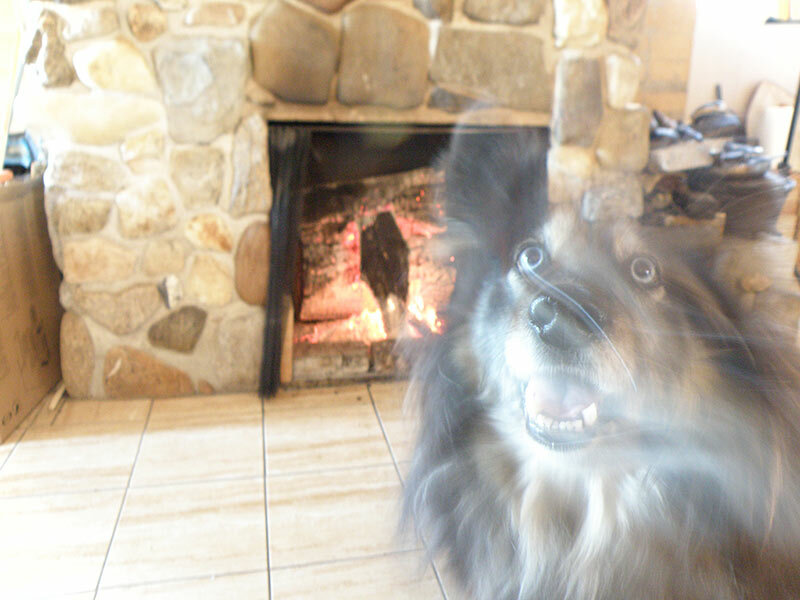 I took this picture of our dog Shaya in front of the fireplace. I don't know why, but the picture came out this way. It hasn't been altered. 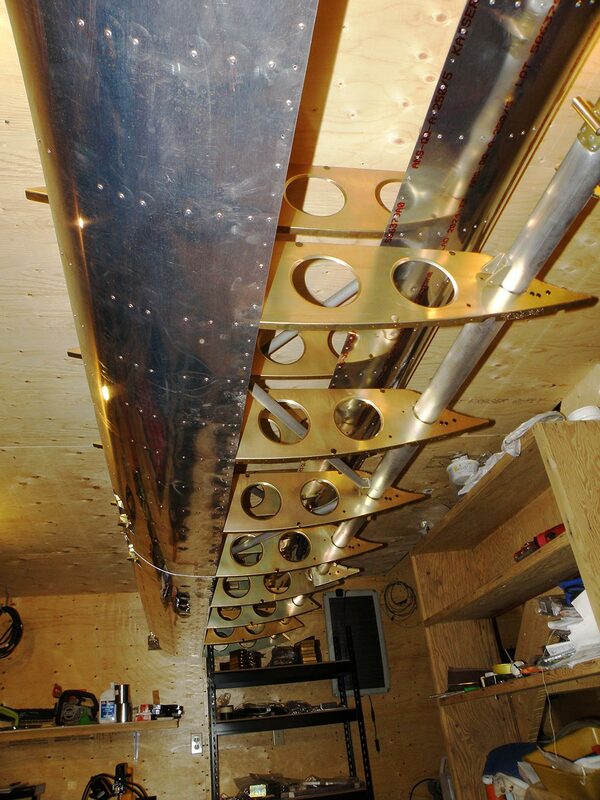 I'm building a small two place airplane for getting into the 'bush' in the North. It has been in our plans for many years. It will revolutionize our Northern outreach. Our prayer is we can get staff to join us and take over eventually. I don't have funds to complete it and am working on it as we can. 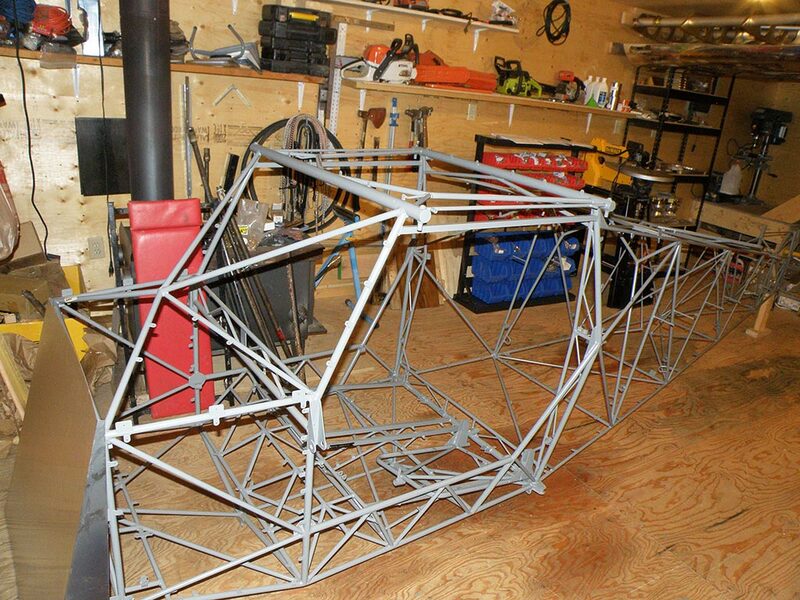 Here is the fuselage ready to assemble the tail & innards. It is a Just Aircraft Super Stol. It will land and take off in 100 to 200 feet. The wings are hanging on the ceiling out of the way. They are ready to be rigged with flaps, ailerons,tanks, etc. and will be fabric covered. This shows how big the tires are. They are designed to run very low pressure and can hanldle big rocks and very rough ground. I don't have the engine or avionics yet. That will be the next big funding challenge. 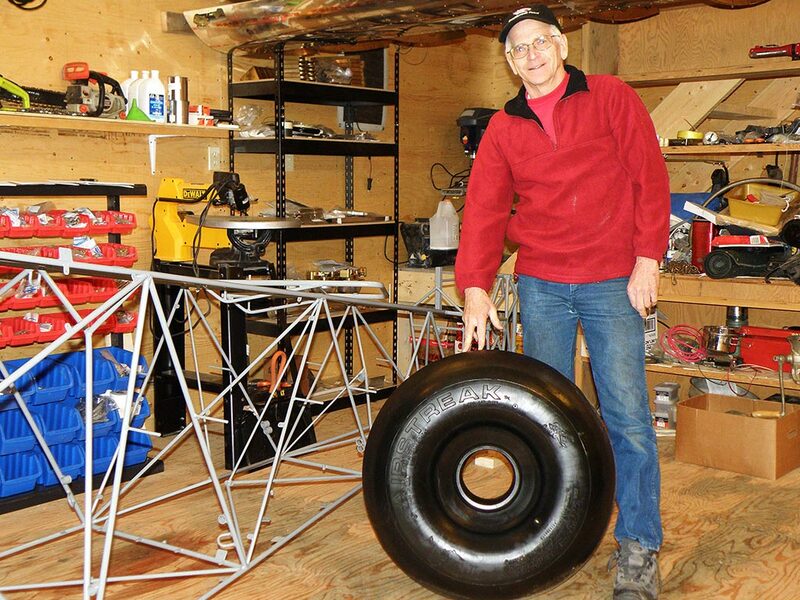 I have all the parts to finish the airframe.